Burgers had sliders but did the craze stick around? 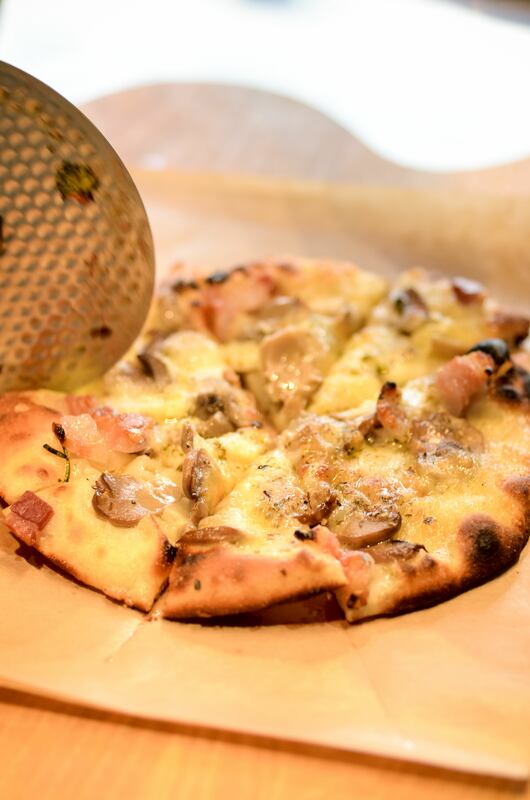 Well today, pizzas has pizzetta, and if they’re all like the ones in Tonda – a word which means ’round’ in Italian – they should be in it for the long haul! 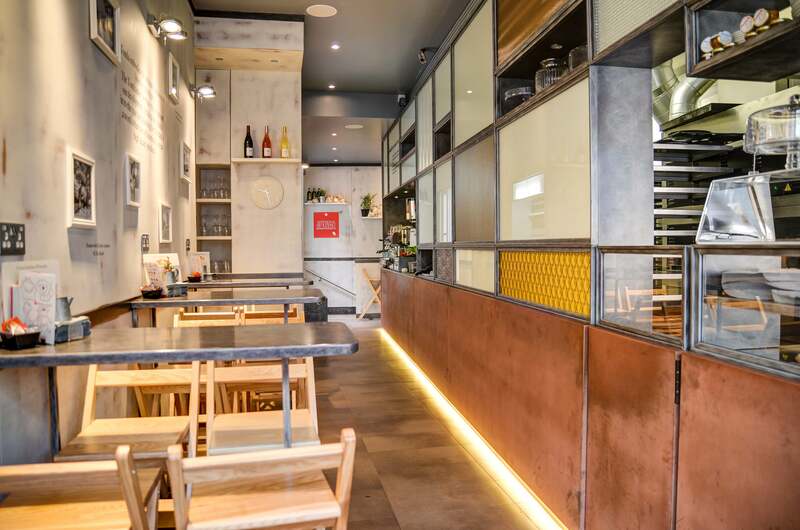 Tonda may indeed be one of fast food’s best-kept secrets in West London. I say that because my friend and I stepped into its unassuming restaurant the other day, without the manic bustling charge of custom it deserves – granted it was a very early dinner! The decor is simple in neutral tones of stone, yellow and brown, with a wall feature mimicking the style of artist Paul Klee. Along the picture-peppered white wall are modest, high-seated pizza bars built for the modern world, with double plug sockets at-the-ready, for those lap-top wielding West-Londoners. The framed photos feature members of the family who opened the Mark I version of the restaurant in Italy during the 1950s. The history is clear, as is the vision from the informative paper menus. “Tradition, Taste, Attention to Detail and Respect are the foundations on which the success of this “Tonda” concept has been built…” It goes on to explain the use of great products where possible and that the base is organic dough; I was already pretty excited. Looking after us was an Italian man named Luca. He spoke with passion about the produce, whilst we explained my friend’s food allergies, which they were happy to accommodate, winning a multitude of brownie points. The opposite to the sometimes very British, “There isn’t a button for that” response we get from some establishments’ waiting staff. The menu is made up of a large range of authentic and delicious sounding pizzette, with enough actual exciting options for vegetarians, which was reassuring. Plus there’s a small number of interesting sounding salads, with a vegan option too. So a pizzetta, as you may have guessed, is a small pizza – just 6 inches in width. They say that the best things come in small packages but if you’re going to make an impact, you really need to pack a punch. I opted for a rare-breed pork sausage and broccoli, whilst my friend an artichoke, pecorino, oregano and black pepper, white base version. Both on a Luca-guaranteed, organic Italian dough. He had also explained, before handing over to a waitress to take care of us, that as each pizzetta is made fresh, we could order more at any time. And with options ranging from as little as £2.80, through to £3.90 for those more luxurious versions, it’s a wonderfully cheap way to try a range of delights. Sadly the waitress who took over our service was less skilled than our initial contact. She wasn’t the same level of attentiveness, but also had the more unfortunate task of having to explain the lack of red wine, through some struggling use of English – talk about a bad time to take over! Nevertheless, what she lacked in linguistic skill, she did make up for in friendliness, which we appreciated. As we waited, making use of those clever plug sockets to rejuvenate our battery-slurping smart phones, I noticed a young Italian diner interacting with staff, whilst tucking into her meal. Not only did her food look delicious but it was reassuring seeing genuine Italian customers chatting away to the Italian staff members – my trust levels in the place soaring. It was at that point I realised just how authentic the eatery was. I started to notice the rousing Euro-pop playing through the speakers, as I took a wander over to the refrigerator. This was armed with Italian beers, along with those glass bottles of soft drinks that remind you of being on a sunny European holiday. People started to enter the doorway for their take-away Italian street food, and without warning I was immediately transported to a lively part of Italy, as business picked up. I took my seat just in time for our 6-inch dressed discs of dough to arrive. And did they hit the spot? They sure did! I thought they were delicious. Not only was the quality of the topping as good as Luca had promised, but you could really taste all that quality; nothing was lost. The base was thin and crisp, with just the right amount of crunch. The sweetness of my tomato base, partnered with the creaminess of the broccoli and cheese combo, was perfect and instantly followed by that herby, salty, meatiness of the sausage cutting through. I was beaming! Of course being the size they are, they didn’t last long, but just long enough for us to scan the menu and make up our minds on a second. We both opted for vegetarian pieces this time around and as before, they were swift in their preparing of them. I felt like my courgette, fresh tomato and olive pizzetta didn’t have the same flair as its predecessor, but it was by default, a less vibrant combination of flavours. The balance of sweet and salt was still there, and you could see the artistically balanced thought process in it, but what consistently stood out was the honest fact that the fresh produce on top was of a high quality. None of that pre-chopped, rubbery rubbish you get in your typical pizza chain. 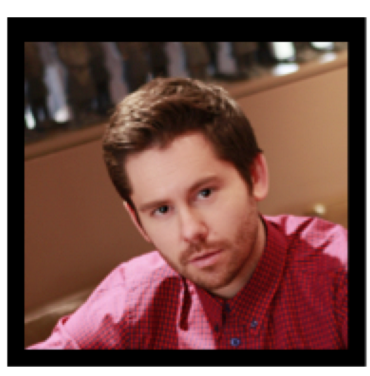 So did they make good on the Tonda ethos? I would say yes. Could it be improved? There’s a little way to go. When it comes to the attention to detail that they say they built the franchise on, I think there’s opportunity for some tweaks. Notably that they had run out of red wine, and do not serve a decaffeinated coffee. They could do with being ever-so-slightly more allergy-aware in their menu, for example seeing a goat’s cheese topped pizza would have been a real plus for those who can’t tolerate cow’s milk. Also, the family feel that they widely promote seemed to not quite be on-point, in terms of its representation inside the establishment. It’s a little in need of the loud, cheery, patriarch/matriarch at the helm to draw custom. 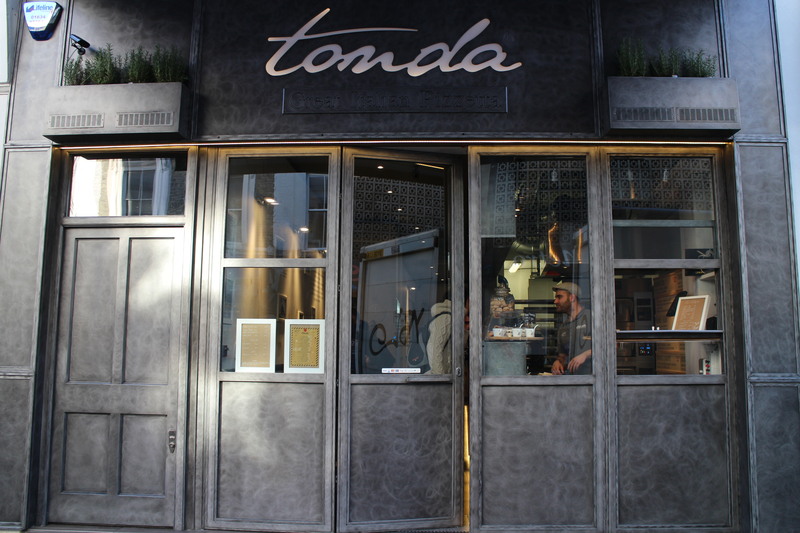 On the whole, our experience at Tonda was enjoyable. The food, without doubt, being the highlight. There feels like a real gap in the market for quality pizzette and for fast food in general being done in this well-executed way. Gone are the days that you had to eat poor quality to eat quick, and it’s thanks to places like Tonda being on the rise. You really can’t fault the care when it comes to authenticity in their food, as well as have respect for that original family dream becoming a full-on reality, and still going over 60 years after it was started.